Free shipping. Buy direct from HP. 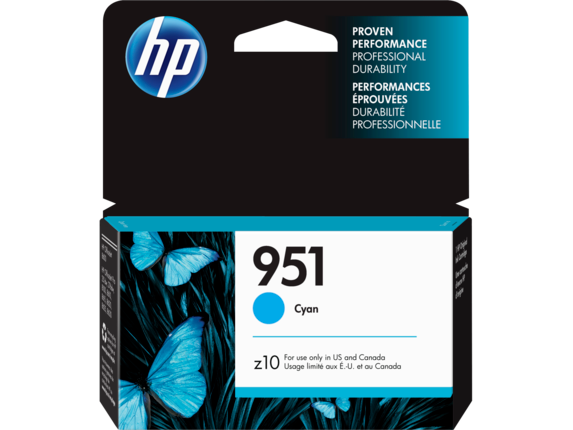 See customer reviews and comparisons for the HP 951 Cyan Original Ink Cartridge. Upgrades and savings on select products. 1 Based on HP internal testing, using paper with the ColorLok logo. 2 Prints made with HP OfficeJet Pro are fade and water resistant. See http://www.hp.com/go/printpermanence. 3 Compared with HP 951 Cyan/Magenta/Yellow Original Ink Cartridges. For more information, see http://www.hp.com/go/learnaboutsupplies. High-yield cartridges not included; please purchase separately. 4 Compared with the majority of color laser printers < $300 USD, Q3 2016; market share as reported by IDC as of Q3 2016. Cost-per-page (CPP) comparisons for laser supplies are based on published specifications of the manufacturers’ highest-capacity cartridges and long-life consumables. CPP comparisons for high-capacity HP ink supplies are based on published specifications of the manufacturers’ highest-capacity cartridges. CPP based on high-capacity ink cartridges' estimated street price and page yield. ISO yield based on continuous printing in default mode. For more information, see http://www.hp.com/go/learnaboutsupplies. 5 HP Planet Partners Program availability varies. For details, see http://www.hp.com/recycle. On recycled materials in cartridges, see http://www.hp.com/go/recycledcontent. 6 Program features and availability may vary by country. For more information, visit http://www.hp.com/learn/suresupply. 7 Program features and availability may vary by country. For more information, visit http://www.hp.com/learn/suresupply.